This is 20% off REGULAR price not the retail price. ps: They got some magazines up to 75% off too, though I haven't checked all of them yet. Not that they are that expensive to begin with, $6-$7, retail. Last edited by Aoie_Emesai; 2008-03-12 at 17:35. It's an offer for customizing a mouse pad for $2.99. 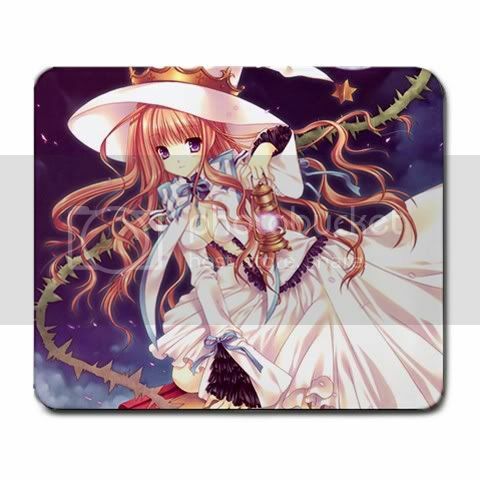 Still a pretty good deal to have your favorite anime/manga image on a mousepad without having to spend more than $10. Just to see how it looked, I took a screenshot of a custom I did. Noted I haven't ordered one, so I'm still unsure how reliable the source is or the quality of the pads. But from my past experiences of using coupon codes from spoofee, I say the code is reliable. I still haven't found the right image yet, so I'll postpone my order until then. Rumor: DeepDiscount may do another 20% off sale again (that's 20% on top of their usual 30-50% discount). For more info, see this thread on Anime On DVD. A complete overview of all past sales can be found here. Also check their weekly specials. While not all of them are great deals, some of them are not so bad. Last edited by GHDpro; 2008-05-30 at 00:40.
www.rightstuf.com is having another 5$ DVD sale. man, how could they sell out of tenjo tengeh already, its only been one day! even sadder, last week I ordered a whole bunch of the exact same stuff thats on sale now! but I can take a joke, might as well order the rest of the stuff in my 'for later' cart. EDIT: tenjoh tengeh came back in stock there are only a tiny bit of copies left! I placed the order I hope I get them all! Last edited by Potatochobit; 2008-06-09 at 17:04. Erm... every business market in Region 1 is in crisis. The economy is facing a decline right now. Rightstuf.com is offering up to 95% off their Anime DVDs. - Click on "DVD Bargain Bin"
I just found the Naruto Uncut Boxed Set, Volume 5 (2005) on sale for $25.49 with free shipping at Amazon. There is no information on how long this sale will last. .99 cents for many mangas something like 500 different titles still available (at this price at they even paying for production costs?). Friend said dealers at conventions buy from this place. Deal lasts til the 26th. Mostly things I hadn't heard of and rarely a full set of volumes, but a decent amount by Clamp, saw a few volumes of FLCL, Cowboy Bebop, Pita Ten, Fruits Basket, Scrapped Princess, Somday's Dreamers, Hoshi no Koe, and the like. (Coupon's for 5 and 10 dollars larger orders (35 and 65). Shipping was decent too. About 160 pages worth of anime DVDs mostly in the $4-8 range.... not too bad. It isn't as crazy as before, but a decent number of good titles for 2 to 4 dollars. I picked up 4 volumes of Moon Phase, for 2 each. Pretty solid deal, I think. There's a handful of well known titles in there, just was passing the word about it being a good deal. I know this has already been said, but the Bargain Bin over at RightStuf.com is fantastic. I recently purchased DVDs 1 and 2 of AIR (and volume 2 included a really beautiful art box that can hold the whole series) for only $7.00 each (... but including an $8.00 shipping price, mind you). Not half bad, if you ask me. There are some really well-known series in the Bargain Bin as well as some obscure treasures (+merchandise!!!). Look around and see what you can find!... I sure know that I was pleasantly surprised (especially when I saw the complete box set of Chrono Crusade in there). This is only for Christmas sale 2009, shop is called: Hairy Tarantula. This store is in downtown, Toronto (Canada). So, if you happen to be in Toronto and wants to d some discount shopping for anime, than take some time to drop by, they offer good help services in helping you find what you want. Amazon has up to 50% off a lot of great DVDs & BDs. just grabbed Full metal panic blu-ray for 30 bucks. Yeah, I bought that one too (why can't season one be cheaper? ), along with Baccano and quite a few others actually. If only they were always this price.